We always offer value for money with totally transparent charges City Electricals is the only London electrical and service company that has 100% transparent charges and we have a clear, upfront, open and honest pricing system. Our rates are clearly shown here and our 24-hour friendly and helpful staff will make customers fully aware of our rates at the time they book their job. Our pricing is ‘middle of the road’ but our service is second to none as our customers will testify. Our Rates: We charge a minimum of one hour on all jobs, thereafter work is charged in 15 minute increments (most other companies charge in half hours). 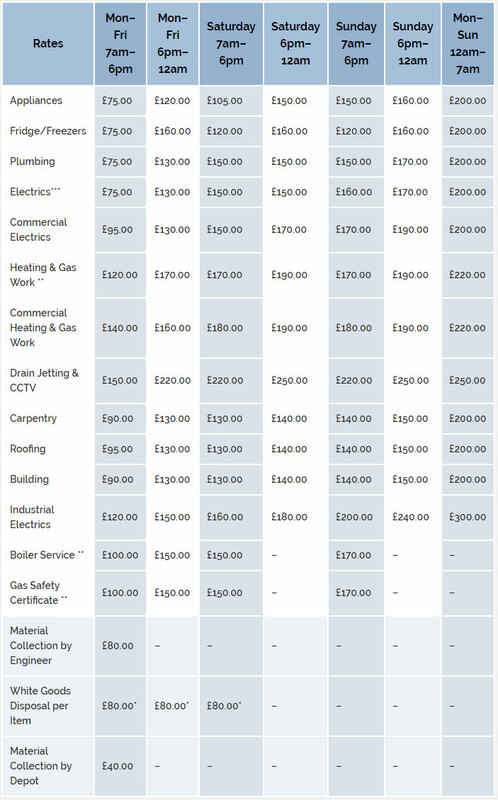 Fixed Prices can be given if requested either verbal or a written quotation by the engineer before work commences. Materials supplied by City Electricals will be charged at trade price plus 25% mark up. Material Collection time for non stock items will be kept to a minimum – any charge will be agreed with the customer in advance and will not exceed £80. Insurance Reports will be chargeable at a nominal £80.00.